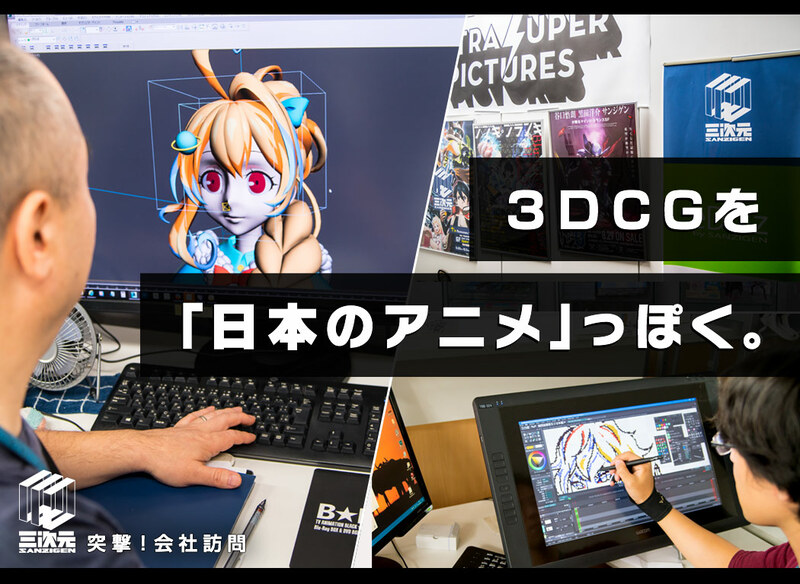 The diffusion of 3DCG animation technology might solve the problems of the Japanese animation industry? What pops into your mind when you hear about 3DCG animation? Maybe Japanese people are more familiar with the classic Japanese style of animation (cel animation). 3DCG animation is broadly used overseas, and you can see examples of it in Pixar movies. In Japan, it's sometimes used for battle scenes in mecha anime and for idol transformations. Although I'm kind of embarrassed to admit this, I don't know much about the evolution of 3DCG animation. But just by taking a look at the dance scenes in PreCure, I can say that computer-created graphics nowadays are amazingly smooth. Japanese cel anime are mostly 2D and are created by drawing several frames and by moving them to create a movie, as you would do with a flip book. Up until now, it hasn't been uncommon for animators to incorporate CG elements in the face and body of the characters. However, recently, it seems that an increasing number of anime and characters is created in CG - resulting in 3DCG anime that still look like they were hand-drawn. One example is the popular Kemono Friends, one of this year's biggest anime hits. 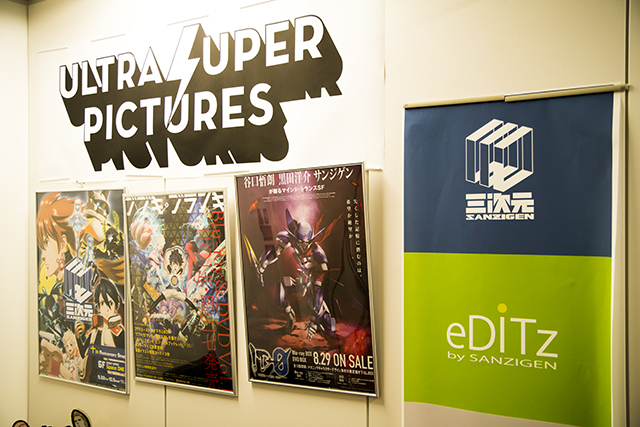 Do you remember our visit to Studio Trigger, in the last issue of Attack!!CompanyVisit? 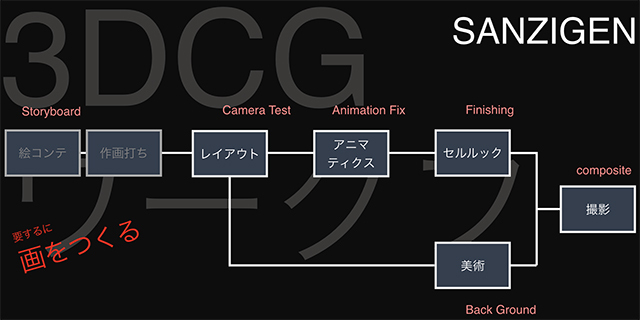 It was the Studio Trigger team who suggested which company I should visit next: it's called Sanzigen, and it's one of the most important when it comes to 3DCG animation. One of their titles, which was created completely in 3DCG animation but which still preserves an hand-drawn feel, is Arpeggio of Blue Steel - Ars Nova. ▲ Sanzigen is in the same building as Studio Trigger. Why does contemporary 3D graphics look so natural!? 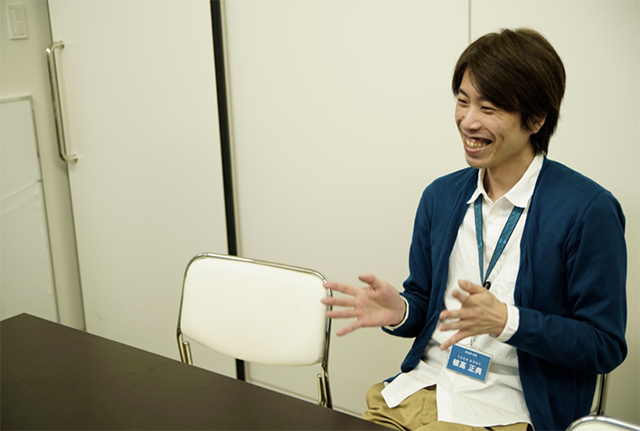 ▲ We have talked to Mr. Uetaka, 3DCG animator, supervisor and consultant at Sanzigen. 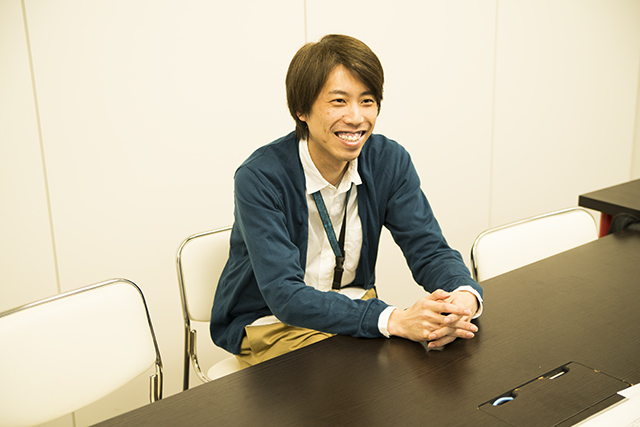 He's currently in charge of Itazura Majo to Nemuranai Machi, an XFLAG original animation starting on December 1st. ▲ Itazura Majo to Nemuranai Machi, an XFLAG original animation. Thank you very much. It's thanks to a technology called "cel-shading" that we can make 3D works look like authentic Japanese cel anime. * Cel-shading: one of CG drawing methods designed to make 3D computer graphics appear to be flat by using less shading color instead of a shade gradient or tints and shades. ▲ A 3D model (left). The same 3D model processed in cel-shading (right). -- Fascinating! It suddenly became 2D! I only have a vague idea of what "anime-style" means. Concretely, what kind of process makes a model look anime-like? At the stage of modeling the shape of a character, we will pay attention to the different consistencies according to the character design. There are many things you have to keep in mind when modeling a character, such as textures, how to paint it, the placement of the various parts... But the biggest thing is shadowing. When we apply shadows to a character, we have to make it look 2D. However, although I said that the placement of the various parts is important, sometimes we need to disintegrate a character in order to come up with a good animation. -- Wait, what do you mean by "disintegrate!? Well, for example, take this expression (left picture). It's a very natural pose for an anime, but if you take the front view of the same character you get something completely different and unnatural (right picture). -- I see! If you're working with natural expressions, you can maintain the integrity of a model. 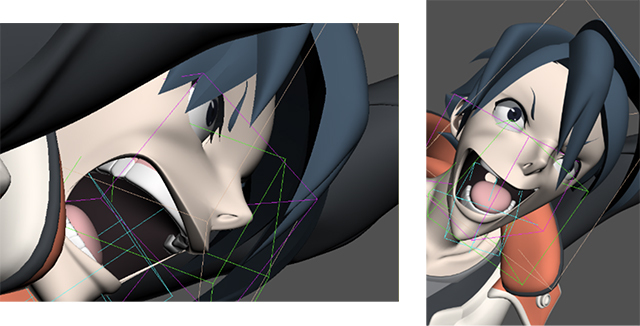 However, if you need to work with exaggerated, anime-like expressions, disintegrating the 3D model is a must! One of the weapons of 3DCG is having a 3D model that can be moved from every angle. However, this also means that sometimes it's impossible to create animations that would go well with cel anime. For this reason, sometimes we just need to throw away that weapon and pursue the cel style in other ways. -- Watching the anime SHIROBAKO I learned how a traditional anime is made: it all starts with a large number of illustrations that are put together to create a movie, then music and backgrounds are added. But how about 3DCG animation? Tell us about it! You can take a look at the general production flow in this picture (↓). The process itself is close to a live-action shooting and includes camera tests and storyboards. Camera Test: a process used to determine the characters acting, the relation between the position of various elements, the direction of the camera and so on. Animation Fix: the process according to which the flow of the animation is decided. 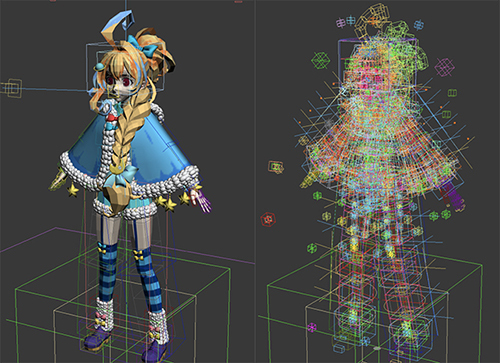 Finishing: the process of adding shades to the polygon model in order to make it look 2D. ▲ From the "layout" stage. -- Interesting! After deciding the flow of the video, you go through several checks, test the motions, add backgrounds... But I can't really picture the concrete process. Is it correct to assume that the CGs are moved on screen just like in MMD? 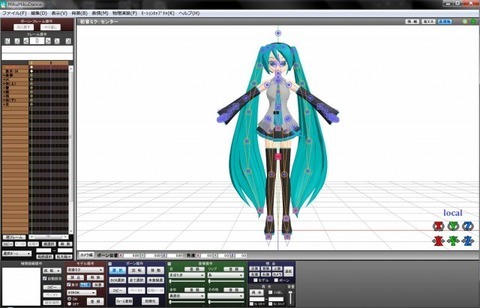 *MMD: "MikuMikuDance", a free 3DCG movie-making tool released for free. Many movies where 3D models dance have been posted to websites like Nico Nico Video. Basically, yes! (laughs) After building a model, we perform a task called rigging, and we establish where the girl’s joints are, how the clothes are moving etc. Once this is finished, we pass it to the animator, and the animator moves the character just like in MMD. Merging beautiful girls to create more beautiful girls? -- I heard it’s pretty hard to reproduce moe movements in 3DCG. However, at Sanzigen, you’re doing an amazing job! Would you mind sharing some tricks? I don’t have many tricks to share; most of them come from experience. Since 3DCG is data, it’s now possible to efficiently create high-quality models that reproduce “cute Japanese anime faces” by combining past assets. -- Do you mean you can re-use past models? It’s a process of trial and error that involves putting together different parts to create a completely new model. 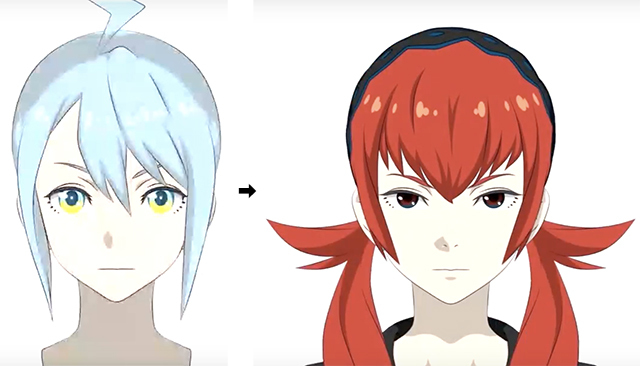 Since anime should always be cute, it makes sense not to create each new model from zero – but to use and customize hair and eyes we’ve created in the past. -- I see! In the past, AKB48 used parts of each girl’s face to create a new girl to use for promotion. It’s a similar process, isn't it? Exactly. “Recycling” models is something that can hardly be done in 2D animation. The know-how packed in the hand-drawn original illustrations is something that belongs to the artist, so it wouldn’t be fair to share it with others. Meanwhile, the more 3DCG graphics you create, the more experience, technology and data can be accumulated. -- I see! This is one of the many advantages on 3DCG. Here’s an example of body parts that have been re-used. Reoko Banryuu from BBK/BRNK was created by using the face from Ultra Super Sisters’ Supica as a base. Yuusuke Kozaki is responsible for the character design of both characters, so we created a model and adjusted it according to the character design. -- Oh, I see! The model is carefully built after the character design. The uniform itself was based on a sailor uniform we created in the past – we just had to adjust its length and the design on the skirt. It saves so much time! 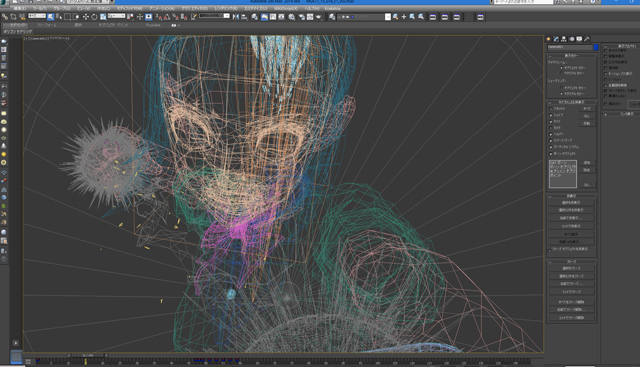 Can 3DCG solve the problems of the Japanese anime industry? -- Apart from the possibility to recycle pre-made models, what other differences are there between 2D animation and 3DCG animation? Hmmm. 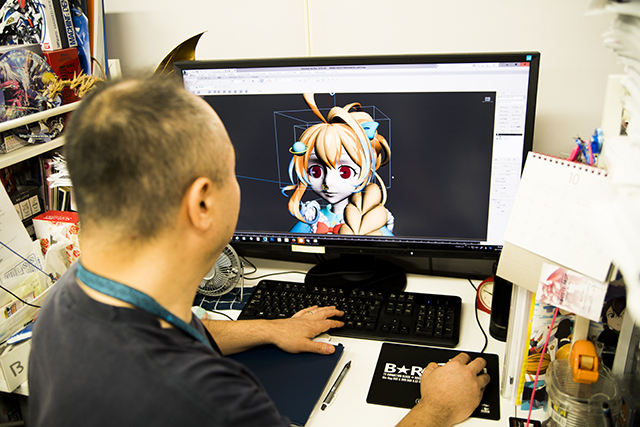 Basically, 3D anime are produced not only between members of the production company, but also require a cooperation with others (artists etc). On the other hand, 3DCG animation can be produced by a single company. It’s quite a big difference. -- In other words, when it comes to 2D animation, the production company has to commission the original illustrations to an artist, then they have to collect them and so on. When it comes to 3DCG, sharing the illustrations and drawings is not necessary since everything happens inside the company. Exactly. And as I said earlier, we can also use some assets we built in the past… We can recycle various materials, such as birds, tanks and tires. A good example of this is Girls und Panzer. It would be hard for a single person to draw such a large number of tanks, but with 3DCG, once you create a model you can reuse it and customize it. ▲ Sharing and using the assets made in the past such as tanks and airframes will make the work more efficient. -- It’s also a way to save on personnel costs! It is! 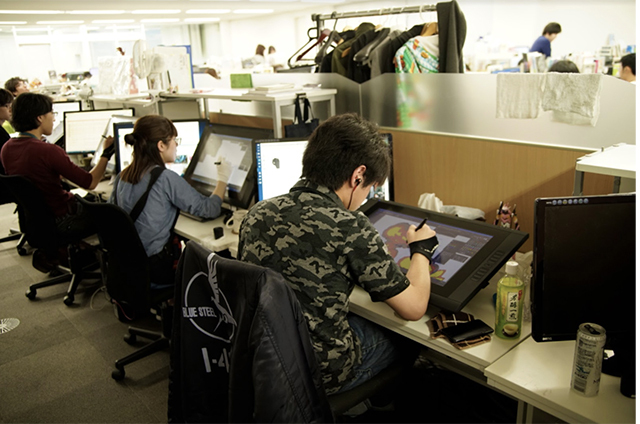 While a TV anime usually takes up to 100 artists to be created, if you’re working with computer graphics it takes just about 20. -- That’s a huge difference! If you manage to lower the personnel costs, you can increase salaries. In 3DCG, a single person is responsible for multiple tasks and this means wages are also higher. -- Wow! One of the biggest problems of the anime industry is the low wage labor, but 3DCG could easily solve it! Yes. I think paying employees a sufficient salary is important in order to keep the level of the industry high as a whole. CG is something that can be used in many different industries. Naturally, if the game world turned out to be more lucrative than the anime world, there would be no reason for skilled people and professionals to stay in the one that pays less. This would take many talented creators away from the anime world, and the quality of the productions would decrease. Therefore, being able to pay creators a good salary is a way to make sure that people stay in the anime industry, and a way to protect it. ▲ Producing digital illustrations with a tablet means merging the technique of hand-drawn animation to the advantages of CG. CG's "uncanny valley" was crossed by "Arpeggio of Blue Steel - Ars Nova"
-- You have various experiences with 3DCG animation production, as an on-site animator, consultant, and director. What represented a turning point for you? The turning point was definitely Arpeggio of Blue Steel - Ars Nova. 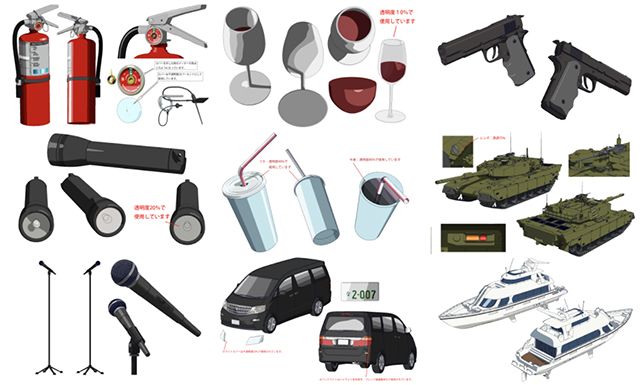 Before it came out, works created using 3DCG were often criticized for not being able to express characters meaningfully, and since viewers weren't familiar with the 3DCG approach, graphics tended to look funny to them. Viewers had this kind of filter that prevented them from enjoying 3DCG; I had a hard time trying to express myself properly. -- But with Arpeggio of Blue Steel - Ars Nova, you managed to tear up that filter! Exactly. I was confident that I could create a high-quality animation while making use of 3DCG, and I realized that the viewers were reacting to it differently. Reactions on Twitter went from "3D is scary, unnatural", to proper comments regarding the contents of the anime. (laughs) Finally, I felt like I could deliver what I wanted to express through my works. And a certain experience regarding the creation of characters in 3DCG was very important to me. -- What kind of experience was that? 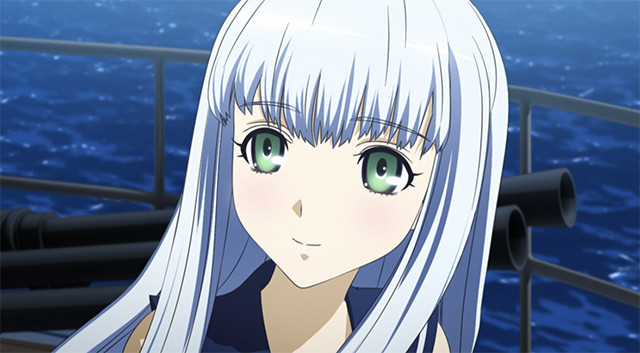 Iona, the protagonist of Arpeggio of Blue Steel - Ars Nova, is a character that goes from being an inorganic robot to acquiring more and more human features as the story goes on. At the same time, her appearance also becomes more natural. That's because the quality of Iona's drawing assets increased as the work progressed - which is something that doesn't happen with 2D animation. It's a feature that is unique to 3DCG. -- What are Sanzigen's plans for the future? We'd like to keep creating animations to please the public, and of course, we'd also like expanding further with some satellite office. It would be great to bring animation studios to rural areas, to break the platitude according to which "anime = Tokyo". 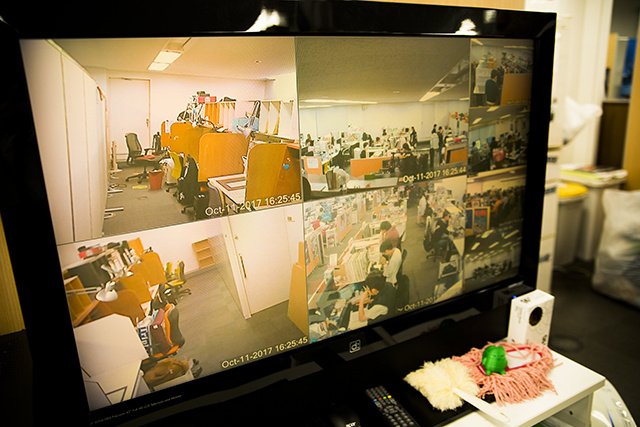 ▲ In the Tokyo office, I spotted some monitors connected to the satellite offices of Kyoto, Fukuoka and Nagoya. In this office, hope and future are tied together towards a new kind of animation production! 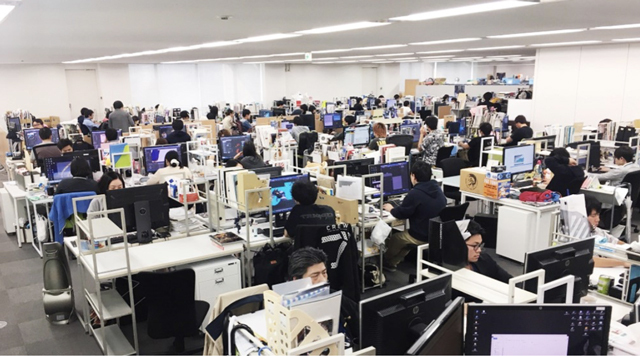 ▲ More than 130 staff members are working in the Tokyo office. Every day, they welcome new approaches and adopt new techniques! Uetaka told us about how accumulating technology and know-how means improving the quality of 3DCG. While leaving aside the unique culture of Japanese cel animation, this new efficient approach to anime might help to create a better world both for creators and for viewers. In this series, we visit creative companies and talk to people who work there. Please look forward to the next installment!